Translation Management Systems for Freelance Translators and Translation Agencies. As a freelance translator, you may already have a bunch of clients and information about their business. You spend time managing your workload, preparing quotes and invoices, and tracking payments from customers. The job of a translator specifically requires gathering megabytes of information in different tables and folders, which can lead to disorganized documents, lost files, and missed deadlines without proper administration. That is not a good strategy for the business. 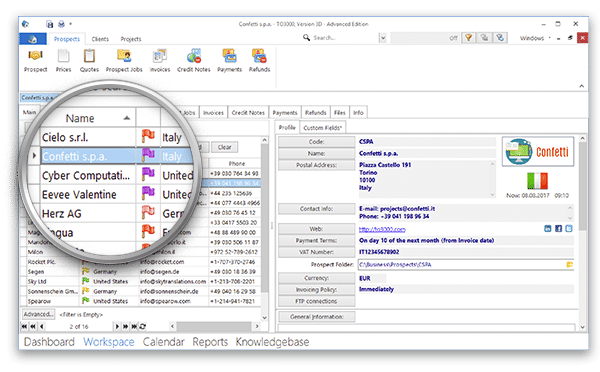 Translation Office 3000 is comprehensive translation management software that allows freelance translators to handle administrative tasks efficiently and provides a foundation for business development. The software will help you build relationships with your prospects and clients, prepare quotes and invoices, track payments, manage your workflow and keep up with deadlines, organize work-related files, and analyze the overall health of your business. TO3000 will help you build relationships with your prospective clients, analyze their needs and requirements, and determine their reasons for refusal. Learn from your mistakes, think ahead, and turn cold leads into hot. You can create quotes and negotiate, even add discounts to close a deal faster. Then you can easily move a prospect to your client list. TO3000 allows you to apply a personal approach with your clients by creating not only a general price list but also an individual one. You can also benefit from multi-currency support, which is indispensable when you work with foreign-currency customers. You can adjust the base currency for doing your business and add a proper currency to a specific client’s profile. The program will convert prices and financial data automatically when necessary. Use all the potential of TO3000 to provide your client a winning business proposal. 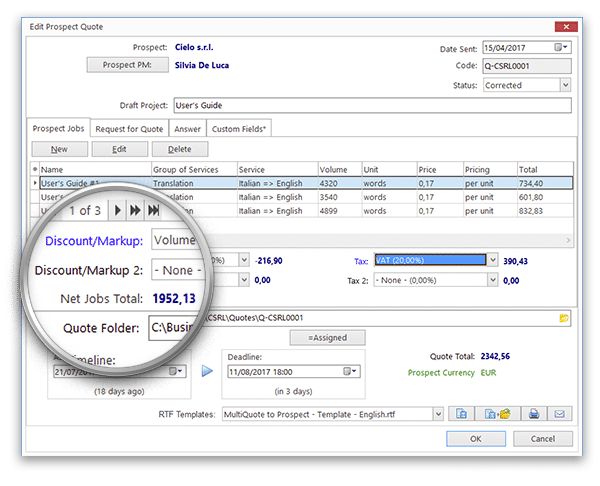 Add to your offer the required number of services, estimate their volume with the built-in AnyCount text count engine, set your price, and apply taxes, discounts, or markups. Use a variety of statuses in a quote and follow the progress of the negotiations closely. 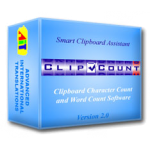 TO3000 has a built-in word and character count tool, AnyCount. It covers 37 file formats and allows word counts not only in the body of a document but also in specific sections such as comments, headers, and footers; it explores hidden text. You can even count words in images, if your source document is a GIF, PNG, BMP, JPG, or PDF. You can count the number of Japanese and Chinese characters or quantify characters in Korean and Arabic languages so that you can provide foreign customers with credible estimates without undue effort. Make the most out of the templates for price lists, quotes, jobs, projects, invoices, payments, credit notes, and refunds. You can save printable documents in RTF, PDF, and DOC formats and customize template layouts without any hassle. You can edit already existing ones or create new versions for your convenience. Send your files right from the program without using a third-party email client. When you open a window with relevant information, such as a translation job, you can click the envelope icon. 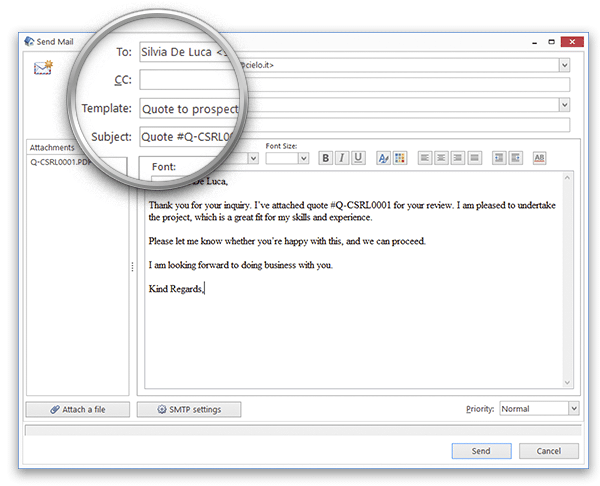 The Mail Sender then automatically attaches the corresponding document to your email and adds text from the related email template to the email body. If necessary, you can edit the subject, the body text, and recipient’s address, attach more files, and set the email’s priority. You can access email template settings through the business settings on the backstage view tab, where you can edit already-existing templates and add any number of new ones as necessary. Clients are the heartbeat of a freelance translation business. And strong relationships with loyal customers is much more beneficial than constantly searching for new ones to make a onetime deal. TO3000 lets you build a comprehensive database, which facilitates effective customer relationships. You can add exhaustive information on your clients’ businesses and associated contact persons and make notes about marketing strategy and future projects. All the information will be right in front of you to help, especially when your business gets larger. If you already have a client database in other programs, you can easily import it when you migrate. Our translation management software lets you assign and follow the statuses of translation jobs in table format or through the calendar. You can display the full list of your jobs or apply filters and select particular ones. The program will help you set priorities, keep up with the deadlines, and identify current, overdue, completed, postponed, or canceled jobs. 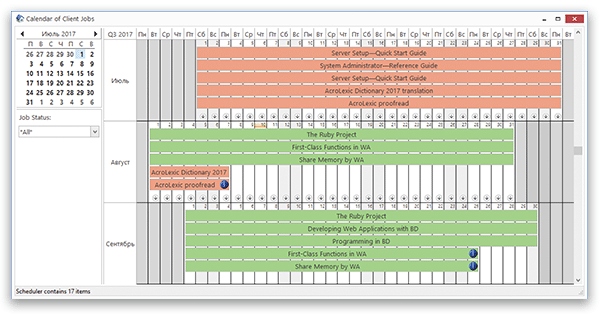 With the calendar view the software displays your jobs’ time frames, so you can manage your time more efficiently. 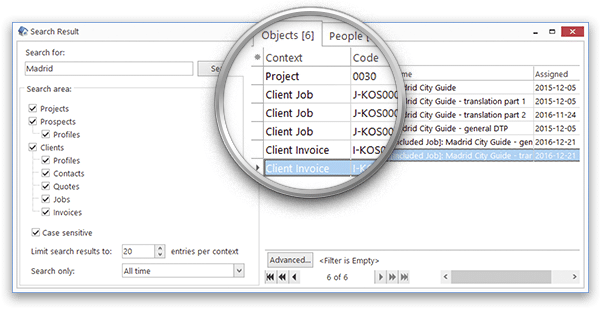 For a narrower and quicker search, use filters and display the jobs with a defined due date or with a certain status (completed, overdue, on hold). TO3000 allows you to prepare professional-looking invoices in just a few clicks. You can add the needed number of translation jobs, enter adjustments, apply taxes, discounts, or markups, specify payment method, and send the document to your client. 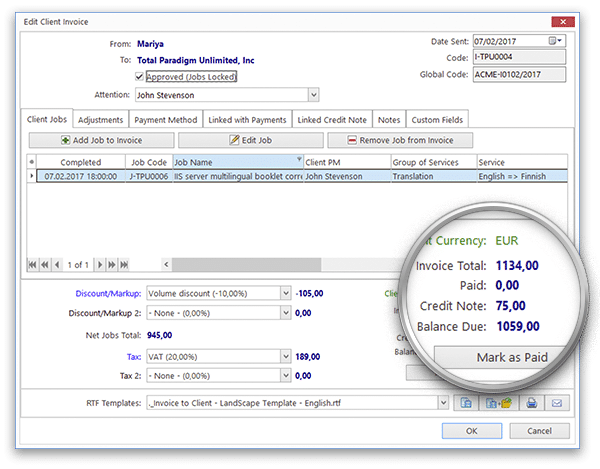 You can also perform mass invoicing for uninvoiced jobs of selected customers to reduce time spent on this routine task. The program sorts workflow files into separate client-related folders and assigns them unique codes. Arranging data about your clients, translation jobs, projects, and source documents will prevent repetition and ensure a clear structure for your records. 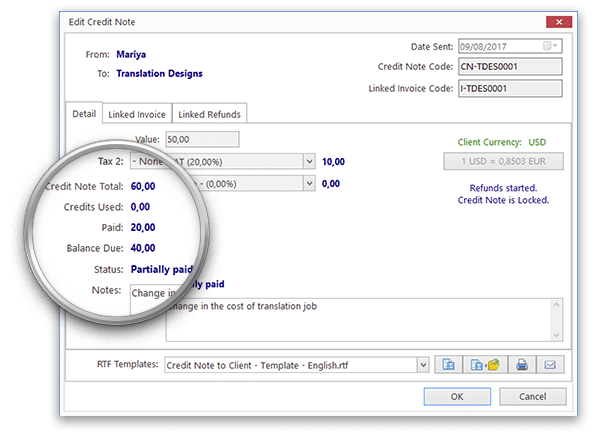 Create a credit note to reduce the totals in an invoice which you have already issued and sent to a customer. Usually, you need a credit note when sums in the invoice are overstated or if job volume has suddenly decreased. If you have already received payment, you can easily issue a refund. 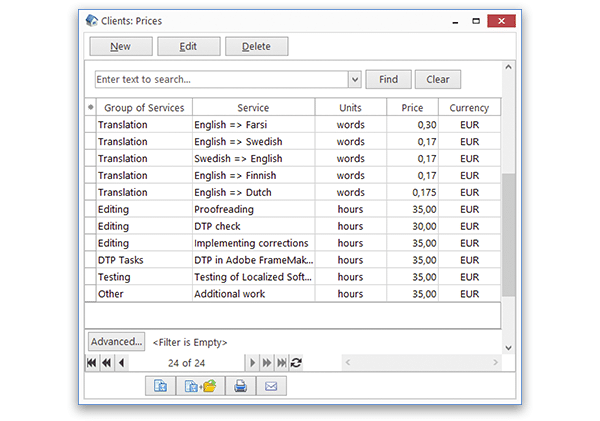 Track outstanding, settled, and not approved invoices through your translation management software. TO3000 assigns statuses to the invoices depending on the payment terms set for each client. Be aware of the health of your business by using the Classic (or Static) and Dynamic reports. 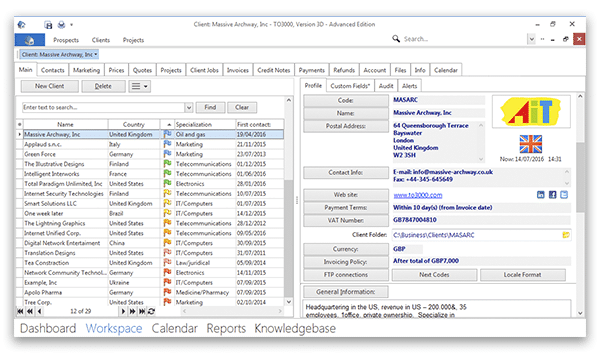 Static Reports provide a basis for an analysis of your productivity and financial performance, profit and losses, services distribution, and the relative importance of your clients for any period of time. 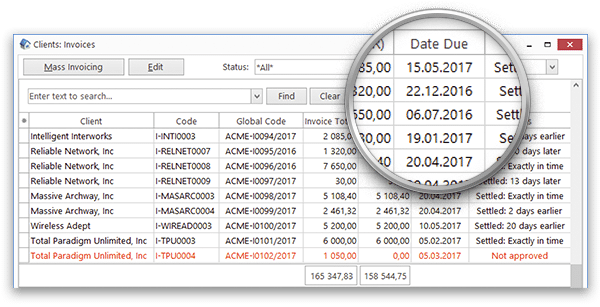 Dynamic Reports allows user-friendly customization via dragging and dropping the parameters in the pivot table. You can create a thorough report from data on clients’ jobs, invoices, and payments. 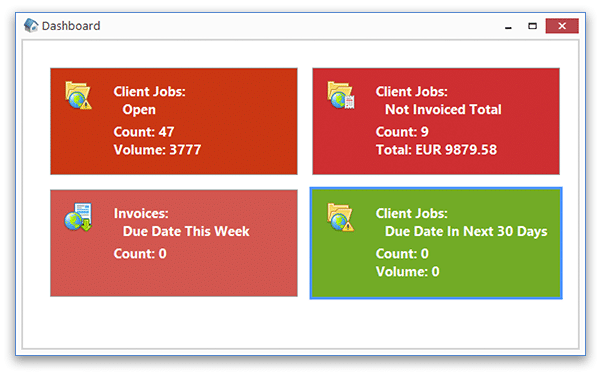 Use dashboard widgets for an overview of approaching deadlines, a summary of jobs and projects, and the number and total amount of overdue and unissued invoices. A new user interface lets you drag and drop widget boxes to customize the view according to your preferences. 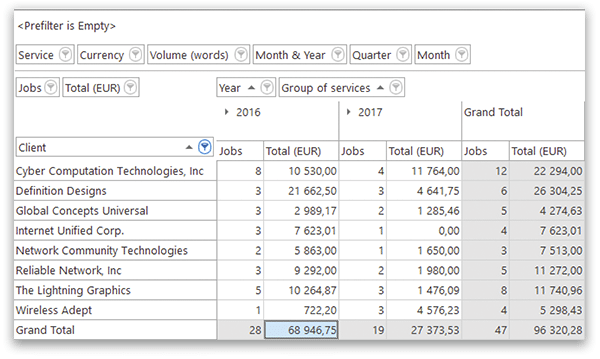 Double-click any widget on the screen to receive more detailed information in the form of a table, which shows the source data. The software has a repository for materials which are useful for your freelance business. You can save and organize general notes, your resume and cover letters, translation memory files and software manuals, dictionaries, and project-specific glossaries. You can easily add to and access this information at any time. You can quickly find any record in your database. TO3000 lets you customize the search parameters and specify if you need to find people or documents, determine a point in time, and select the appropriate section of the software for searches. 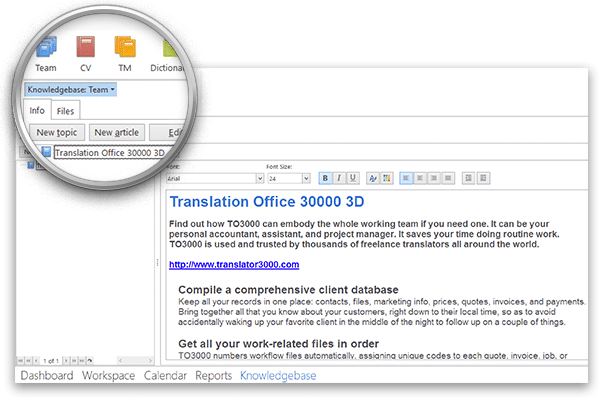 Click to download FREE trial version of Translation Office 3000!